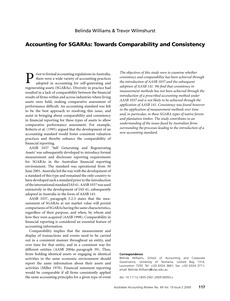 The objectives of this study were to examine whether consistency and comparability has been achieved through the introduction of AASB 1037 and the subsequent adoption of AASB 141. We find that consistency in measurement methods has not been achieved through the introduction of a prescribed accounting method under AASB 1037 and is not likely to be achieved through the application of AASB 141. Consistency was found however in the application of measurement methods over time and, in particular, in these SGARA types of native forests and plantation timber. The study contributes to an understanding of the issues faced by Australian firms surrounding the processes leading to the introduction of a new accounting standard.